If you are lucky enough to stay in Sibiu more than one week, then don’t you waste not even one day and start looking for trips starting from Sibiu. You might think that this alternative of not getting bored is not what you have wished for your holiday, but you cannot even imagine what will be expecting you if you drive a few kilometers away from this amazing city. Breathtaking landscapes, natural reservations, fortified churches, mountains resorts and amazing country sides will offer you the time of your life, helping you to get a better picture of the Romanian culture. 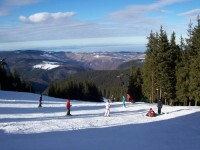 Only half an hour away from Sibiu, Paltinis is the highest and the oldest resort in Romania. Although quite crowded in and around winter season because of the skiing track in Oncesti Mountains, Paltinis is also visited in the summer when tourists reach this place for outdoor activities full of adrenaline. This place is also a perfect starting point for many touristic destinations in Mountain Cindrel and Lotru, but also a wonderful place to visit and get to know better. The famous Romanian philosopher Constantin Noica has left a part of his life and work here, so do not miss it. There are 15 natural areas around Sibiu protected by the authorities, so this should convince you about the beauty and uniqueness of these landscapes. These areas comprise a botanical reservation, complex regions of flora and fauna, salt lakes formed in ancient salt mine and nature monument having important geological values. 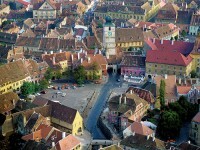 They are all located somewhere around Sibiu, so visiting them might require a day from your scheduled holiday. Are you longing for some sun and water? Ocna Sibiului, also called “The sea of Ardeal” is located only 15 km away from Sibiu. It represents the result of the imminent transformation of deserted mines in salt water lakes. Its therapeutic properties have been discovered by King Rudolf II who stopped for a few days in this area on his way to Constantinople. The benefits of this water are numerous and guaranteed, for diseases related to locomotion system, chronic degenerative rheumatisms, pre-arthritis and arthritis, spondylitis, as well as various gynecology illnesses. Nowadays the Ocna Sibiului Health& Spa has been modernized and fully equipped offering amazing therapeutic procedures and relaxing procedures to its numerous visitors. Also do not forget about the fortified churches dating from XIIth to XVIth centuries when it comes to taking trips starting with Sibiu. Just gather more information from an Info Point and start planning. You won’t regret it!